Matt Smith made a guest appearance ‘The Late Late Show with James Corden’ on Wednesday (August 15), where he shared that he learned of his Emmy nomination while in Russia lamenting England’s elimination from the World Cup, and what advice he’s given to ‘The Crown’ new addition Tobias Menzies as Prince Philip. 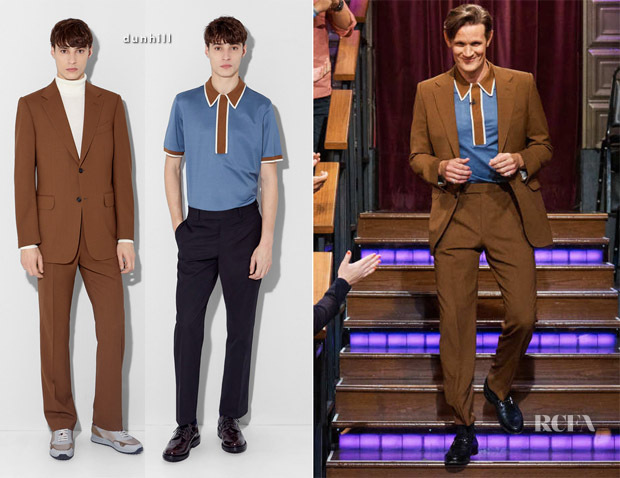 If you had said to me that Matt Smith was going to wear cinnamon dunhill suit with blue-and-cinnamon placket polo shirt, and that I was going to love it, I would’ve thought you were bantering me. But I do. I absolutely love it. There’s a certain retro charm to this look, along with the charismatic way in which he is wearing the suit that made this an instant hit. Add in the fact that dunhill London represents the best of British, as does Matt Smith, and this was really a match made in fashion heaven. Tracee Ellis Ross In Simone Rocha – Jimmy Kimmel Live!